LITE-SHL-HB Series utilizes Philips LUXEON LEDs and Mean Well HLG LED Drivers. Available in 30°, 45°, 90° and 120° beam angles and up to 140lm/W. The LITE-SHL-HB Dual Purpose Light is a specialized high-grade commercial high bay light or flood light used in industrial applications where day light is required including factories, loading docks, crane, building/bridge lighting, sporting ovals, etc. Available in 300W, 400W and 500W modules, or dual 500W to make 1000W, and 30°, 45°, 90° and 120° beam angles there is enough flexibility to suite most applications and roof or tower heights. Please inquire about our other products with beam angles ≤ 30°. The competitive pricing of this product makes it idea for out door sporting oval lighting for football, netball, soccer, bowls, etc clubs on a budget. Its light weight at approx 10kg also allows its application in situations where weight saving is critical. At 500W and up to 70,100lm or 140lm/W the LITE-SHL-HB-500W can meet the lighting requirements of a 2000W conventional metal halide high bay light. The positioning of the LEDs allows almost 100% light projection towards your loading dock, car park or factory, unlike the sideways mounted and omni-directional bulb of a metal halide which has much greater light scatter losses and relies on the quality and efficiency of the reflector. The higher efficiency of the LED projection system and higher lumen maintenance (L70 of 34,000 hours @ 85°C) means there is little loss of light over time and allows up to 75% energy savings to be achieved paying off your capital investment in less than a year in many applications. In contrast, the metal halide has a poor lumen maintenance degrading to around 50% of the original light and is vulnerable to knocks leading to a very poor lifespan. 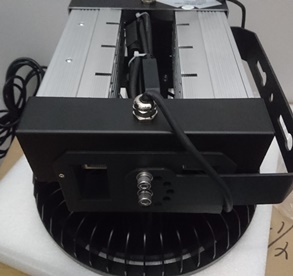 The LITE-SHL-HB-500W is available in a dual module bringing the total output power up to 1000W or 140,000lm which can potentially match the output of a 4000W metal halide. 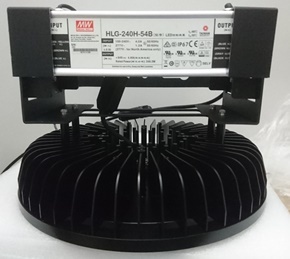 The Luxeon LEDs in the LITE-SHL-HB series high bays are driven by 1 to 2 separate 240V Mean Well HLG-240H-36A or HLG-240H-54A LED Drivers to make up a maximum output of 500W. Backed by an independent 7 year 60,000 hour manufacturer warranty and established in 1982, Mean Well is the leading standard switching power supply manufacturer in the world and has full electrical safety and EMC approvals for use in Australia. 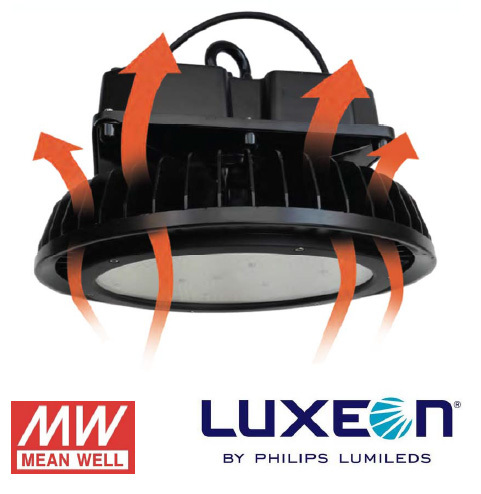 As shown in the image the Mean Well drivers are mounted independently from the LEDs with vented power box, large air gaps and separate heat sinks to permit maximum cooling of both LEDs and power supply for increased life span. The MeanWell HLG Series driver has SAA, C-tick, CE, RoHS, UL, TUV, andCB certification. In the case of heavy industry and mining applications we can offer a high voltage version of the LITE-SHL-FL-500 LED Flood Light such as 410V option using Meanwell HVG-240 Series LED Drivers. Separate Driver and LED heat sinking. Separate heat sinking for both driver and LEDs plus air gap between LED and driver heatsink extends life of both driver and LEDs. Product Features - 5 Year Manufacturer Warranty. Dimmable option using 1-10v DALI. 300 to 500W options can replace up to 2000W metal halide. Multiple fixing/bracket options and cable lengths available. 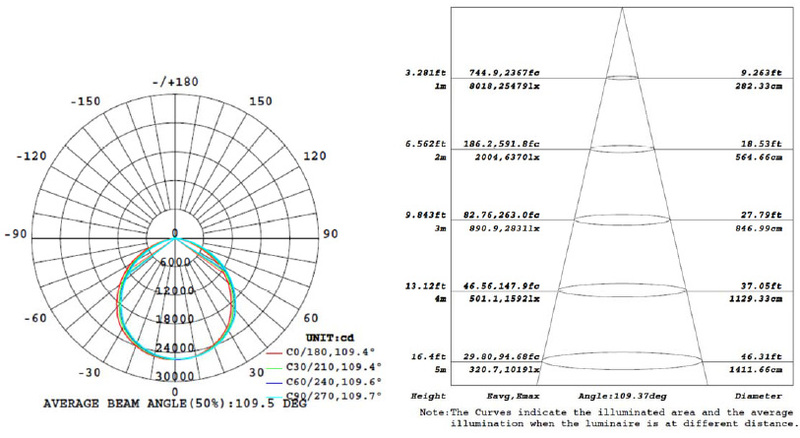 Note the Lumens represented in the Illuminance Cone Diagram is equal to 73% of the total light output. Allow for light scatter and reflectance in surrounding areas when making estimations. Light comparison will depend on age of existing metal halide high bay lights and efficiency of housing reflector. * Please note in many instances RCM/C-tick/SAA applies to the electrical power supply/LED Driver. Click the button below to add the 300W, 400W, 500W LED Dual Purpose High Bay UFO Light or Flood Light or 1000W Dual Module Up to 141 lm/W - 1000W to 2000W Metal Halide High Bay Replacement to your wish list.